The Torre dell’Orologio or Clock Tower on the north side of Saint Mark’s Square in Venice is an early Renaissance tower dating from the end of the 15th century. 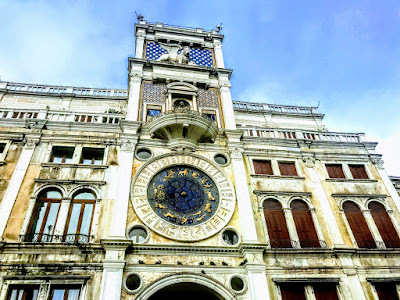 Its location was chosen so the clock could be seen from the waters of the lagoon and let everyone who arrived know of the wealth and glory of Venice. The clock and tower stand above archway into the main street of the city, the Merceria, which linked the political and religious centre of the city at Saint Mark’s with the commercial and financial centre at the Rialto. Two great bronze figures known as the Moors strike the hours on a bell. One is old and the other is young, to illustrate the passing of time. Below is an image of the winged Lion of Saint Mark with the open book, before a blue background with gold stars. Below the lion, a semi-circular gallery has statues of the Virgin Mary and the Christ Child. On either side are two large blue panels showing the time: the hour on the left in Roman numerals and the minutes at five-minute intervals on the right in Arabic numerals. Twice a year, on the feast of the Epiphany (6 January) and on Ascension Day, the three Magi, led by an angel with a trumpet, emerge from one of the doorways normally taken up by these numbers and pass in procession round the gallery, bowing to the Virgin Mary and Christ Child, before disappearing through the other door. Below again is the great clock face in blue and gold inside a circle of marble engraved with the 24 hours of the day in Roman numerals. A golden pointer with an image of the sun moves around this circle and indicates the hour of the day. Within the marble circle beneath the sun pointer are the signs of the zodiac in gold. These revolve slightly more slowly than the pointer to show the position of the sun in the zodiac. In the middle of the clockface, the earth and the moon are surrounded by stars against a background of blue enamel. The clock was made by a father and son, Gian Paolo and Gian Carlo Ranieri. The tower was built in 1496-1497, the mechanism of the clock was then built into it, and the clock and tower were inaugurated on 1 February 1499. Legend says the clock’s craftsmen were later blinded to stop them from repeating the work. By 1500, the elder Raineri had died. But his son remained in Venice to look after the clock, and he continued to live in Venice until he died in 1531. The Venetians use the term acqua alta for the exceptional tides that flood the city periodically when they reach their peak in the Venetian Lagoon. This mainly happens between October and March, when high tides are reinforced by winds that hamper the usual reflux. 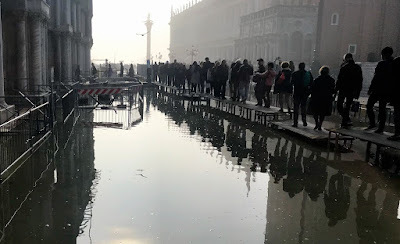 As we were leaving our apartment halfway between Rialto and San Marco on Thursday morning [8 November 2018], the water had come to the step at the front door. 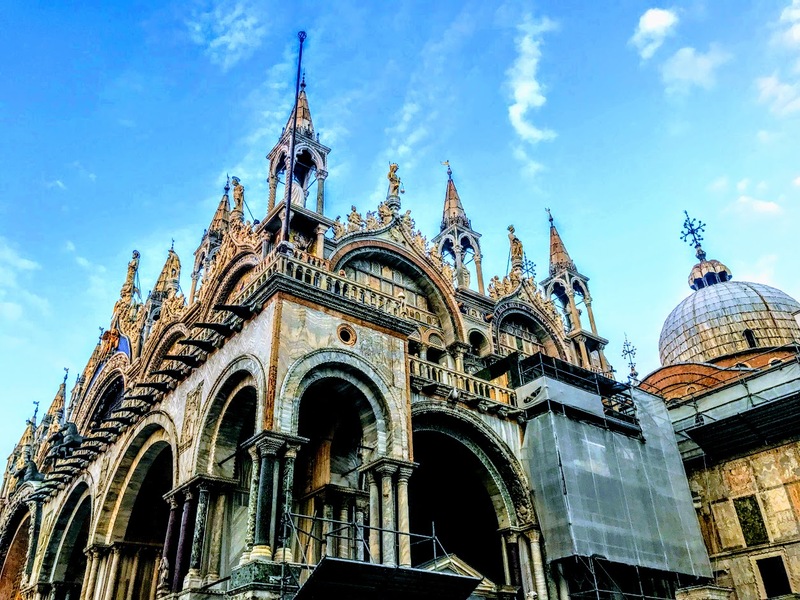 By the time we got to Saint Mark’s Square, the water was shin-high in many parts, with people using the duck walks to tip-toe their way around the square, in front of Saint Mark’s Basilica and the Doge’s Palace, and down to the waterfront. Many shops and cafés simply had to resign themselves to losing business. 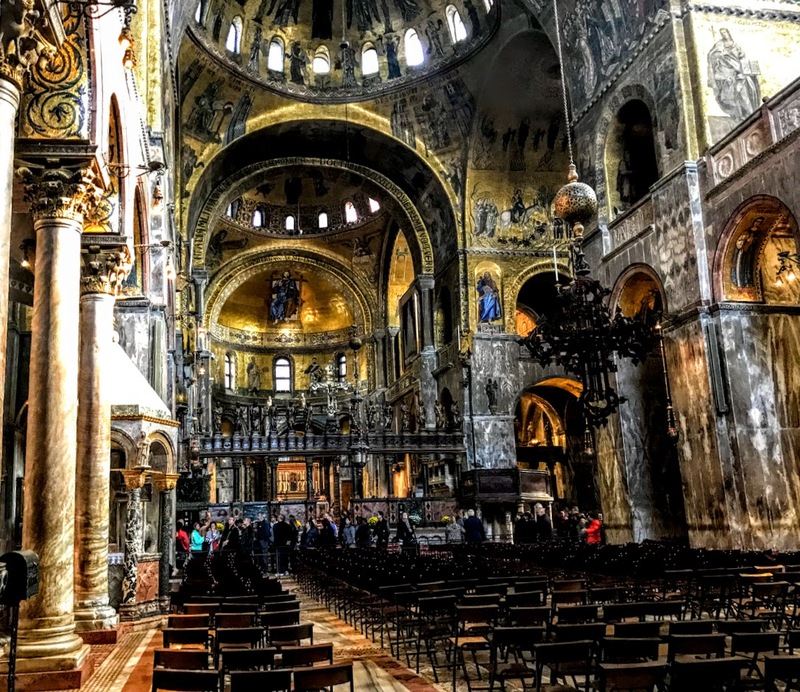 But old adages about ‘ill-will’ that blows no good and the ‘rising tide’ that lifts all boats came to mind as I realised that there were no queues outside Saint Mark’s Basilica, and we were inside in less than two minutes. The Patriarchal Cathedral Basilica of Saint Mark is the cathedral of the Archdiocese of Venice. It is the most famous church in the city, but also one of the best examples of Italo-Byzantine architecture. Originally, Saint Mark’s was the chapel of the Doges of Venice, and it has been the cathedral only since 1807. Before that, the Patriarchs of Venice were seated at San Pietro di Castello. 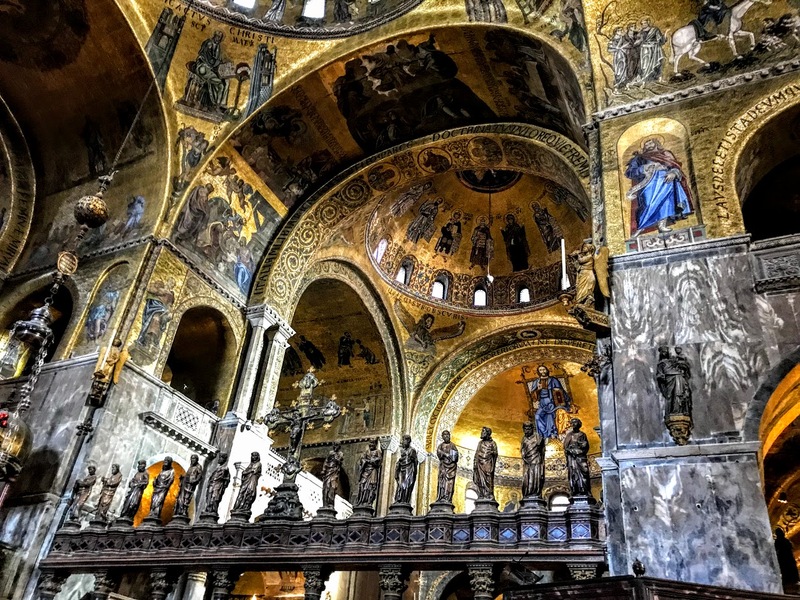 Because of its opulent design, its mosaics and the wealth of its decoration, outside and inside, it has become a symbol of Venetian wealth and power, and it is often known as the Chiesa d’Oro or Church of Gold. The first Church of Saint Mark at this site beside the Doge’s Palace was built in 828-832, after merchants from Venice had stolen the body of Saint Mark the Evangelist in Alexandria. The present basilica was built from about 1063 and was completed in stages, and its basic shape includes a mixture of Italian and Byzantine features. The supposed but lost body of Saint Mark is said to have been rediscovered in a pillar by the Doge of Venice, Vitale Faliero, in 1094. Although the basic structure of the building has not been much altered, its decoration has changed greatly over time. Inside, there is a dazzling display of gold ground mosaics on all the ceilings and upper walls, but many of the adornments are the spoils of classical and Byzantine buildings, including the ninth-century Pala d’Oro from Constantinople, installed on the high altar in 1105, were plundered or pilfered during the Crusades and other wars, including mosaics, columns, capitals and friezes. In the 13th century, the church changed from being the private chapel of the Doge and became the state church and the venue for great state and public ceremonies, including the installation and burial of Doges. The exterior of the west façade is divided into three registers: lower, upper and domes. In the lower register of the façade, five round-arched portals, enveloped by polychrome marble columns, open into the narthex through bronze-fashioned doors. 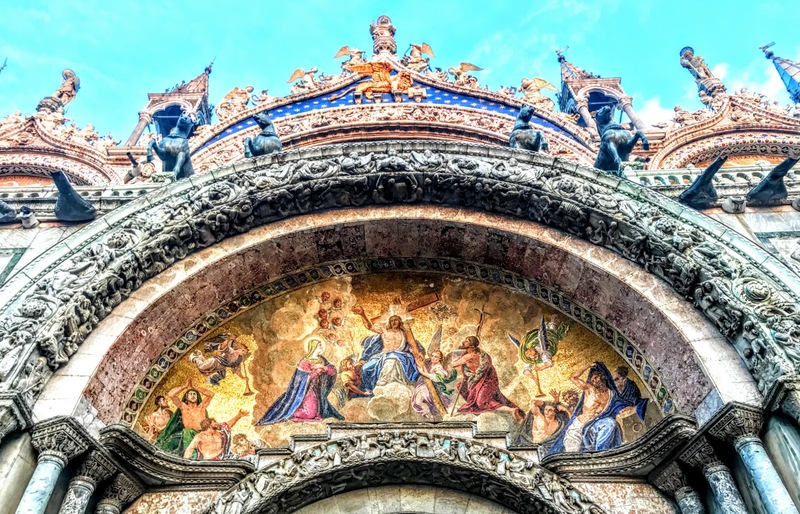 The upper level of post-Renaissance mosaics in the lunettes of the lateral ogee arches depicts scenes from the Life of Christ, culminating in a 19th century replacement Last Judgment. Mosaics with scenes showing the history of the relics of Saint Mark fill the lunettes of the lateral portals, some of the mosaics dating from the 13th century. Above the large central window of the façade, under Saint Mark, the Winged Lion who is his symbol and the symbol of Venice, holds a book quoting Pax Tibi Marce Evangelista Meus (‘Peace to you Mark my evangelist’). In the centre of the balcony, four bronze horses face the square. The were installed about 1254, but date from Classical Antiquity – some accounts say they once adorned the Arch of Trajan. The horses were long displayed at the Hippodrome of Constantinople, but in 1204 Doge Enrico Dandolo sent them back to Venice as part of the loot sacked from Constantinople in the Fourth Crusade. They were taken to Paris by Napoleon in 1797 but returned to Venice in 1815. After a long restoration, since the 1970s the originals have been kept in Saint Mark’s Museum and the horses on the façade today are bronze replicas. 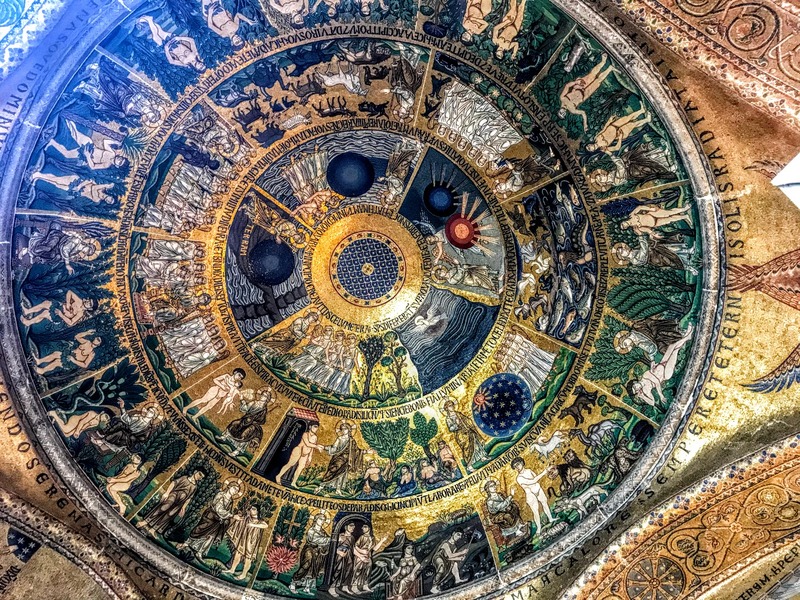 The narthex or porch, dating from the 13th century, prepares the visitor for the gilded interior, with Old Testament scenes from Genesis and the lives of Noah, Abraham, Joseph and Moses. On the wall above and at the sides of the main doorway, the Four Evangelists and saints are depicted in 11th-century mosaics, the oldest in the building. The porphyry statue of the Tetrarchs at the south-west corner of the basilica have been removed during current restoration work. But they represent the four co-emperors introduced as a new system of government by the Emperor Diocletian in the third century in an attempt to stabilise the Empire. This statue too was taken from Constantinople during the Fourth Crusade in 1204. Inside, Saint Mark’s is based on the design of the Emperor Constantine’s Church of the Holy Apostles in Constantinople. The plan is based on a Greek cross, with each arm divided into three naves with a dome of its own as well as the main dome above the crossing. The dome above the crossing and the western dome are bigger than the other three. The lower levels of the walls and pillars are covered with polychrome marble slabs. The upper levels are covered with bright mosaics covering an area of about 8,000 sq m. The earliest surviving work is in the main porch, and probably dates from around 1070. 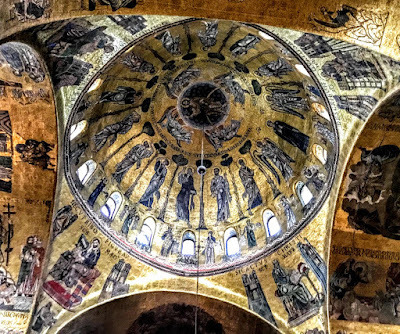 The main work on the interior mosaics was complete by the 1270s, but most of the mosaics were replaced in the late 18th and early 19th centuries. The large Christ Pantocrator, seated above the patron saints of Venice in the main apse, is a 15th-century recreation. The East dome over the high altar has a bust of Christ in the centre surrounded by prophets, the Virgin Mary and the Four Evangelists. The Ascension of Christ is depicted in the central dome and Pentecost in the west dome. The marble floors of the basilica date from the 12th century. In Saint Peter’s chapel in the left transept, the Madonna Nicopeia is the best-known Byzantine icon in Venice, also taken to Venice during the Fourth Crusade in 1204. The treasury also holds a collection of Byzantine objects looted from Constantinople after the Fourth Crusade and later in 1261. After stopping for prayer in Saint Peter’s Chapel, we realised that Mass was about to begin beside us in Saint Isidor’s Chapel. 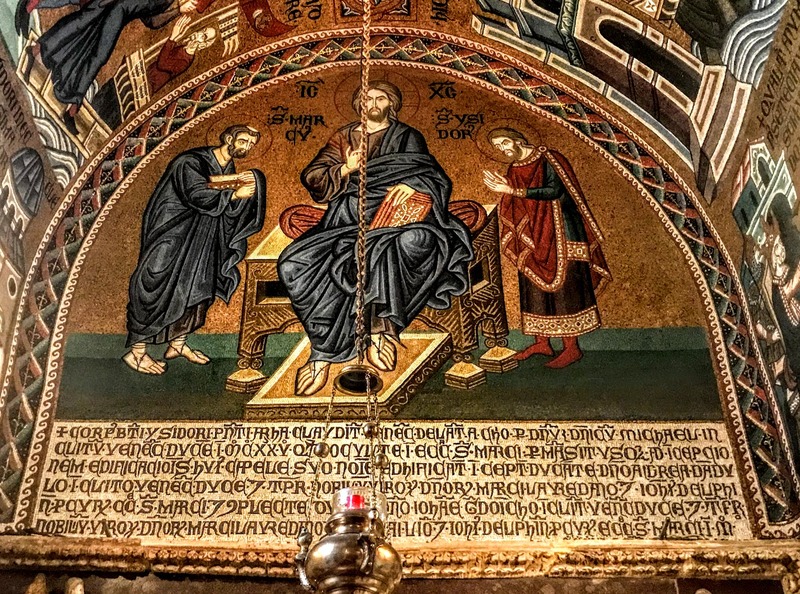 There we joined a congregation of about 12 or 14 in the chapel built to house the body of a third century martyr taken from the Greek island of Chios to Venice in 1125. After Mass, we left the Basilica to join the tourists once again along the duck walks in Saint Mark’s Square down to the waterfront, shrouded in mist and fog.